Salih Khater has been named as the suspect being held on suspicion of terror and attempted murder offences after three people were injured when a car hit cyclists and pedestrians outside the Houses of Parliament. What do we know about him? Mr Khater, 29, is a British citizen of Sudanese origin from Birmingham. He is understood to have been granted asylum after coming to the UK as a refugee in 2010. He lived in a first-floor flat above some shops in Sparkbrook until four months ago, when he moved to Highgate in the city. But his brother described him as a normal person with no links to any religious group and no fanatic or terrorist leanings. Abdullah Khater told BBC Arabic the family was in a state of shock. Salih Khater studied electrical engineering at Sudan University of Science and Technology after completing school education in Gezira state, in the east-central region of Sudan. According to Abdullah Khater, Salih is one of five brothers and two sisters. Their father, a farmer, died few years ago. He said the family was originally from Darfur but moved to Gezira to work in agriculture at the Gezira Scheme, one of the largest irrigation projects in the world. Coventry University said Mr Khater studied accountancy there between September 2017 and May 2018 but failed the first year of his course. It said he did not live in halls during his time at the university. South & City College in Birmingham told the BBC Mr Khater studied there for a diploma in science between 2014 and 2017 and that he studied ESOL - a course aimed at improving the English of non-native speakers - between 2010 and 2011. According to his neighbours in Sparkbrook, Mr Khater was a quiet man who had frequently visited an internet cafe and a shisha lounge, both on Stratford Road. A Facebook profile, believed to be his and has now been disabled, says he had been working as a shop manager in Birmingham. Shared music videos on the Facebook page are by artists including Celine Dion and Eminem. Likes on the page include I Am Sudanese and the sport of basketball, with status updates in both English and Arabic. Another "like", in April, was for a blog post about how a Birmingham school was giving students the skills to deal with and protect themselves from extremism and radicalisation. A flat above the Bunna Internet Cafe on Stratford Road in Sparkbrook was searched by police on Tuesday night. Mohammed Hussein, who owns the flat, described Mr Khater as a good tenant who was "no trouble". He "never had an issue" with him, adding he always paid his rent on time. Mr Hussein said Mr Khater moved in in about April 2017, and left four months ago, although he said he had come back regularly since - including the night before he went to London. He said Mr Khater had used a computer during his visit, which had been taken by police. Image caption Ahmed Abdi described Mr Khater as a "quiet man"
Sparkbrook resident Ahmed Abdi said: "I recognised his picture from the news and I was shocked. "He was around here almost every day and I was here yesterday when the police turned up. He was very quiet and he used to drive a small white car, a really old one. 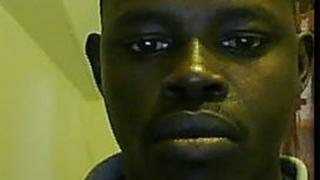 Mr Abdi, 43, added: "Salih, I know him a year-and-a-half... I know him from the shisha lounge upstairs - I used to go there every morning. I smoke shisha around 11 o'clock and Salih was there." Israr Rafiq, who also lives locally, said he thought Mr Khater just panicked. He said there were ambulances behind him and he would have just been trying to get out of the way. Another man, who did not want to be named, said he knew Mr Khater, whom he said had gone to London to get a visa. He asked: "Would there have been this reaction if it was an old white man?" Mr Khater is also believed to have lived in Brinklow Tower in Highgate, where there was a police presence on Wednesday. Near the building, a man calling himself only Adam said he knew Mr Khater as a "very very good man". "I couldn't see him doing anything stupid like that," he said. Adam said Mr Khater was "polite, humble, friendly, kept himself to himself". He added: "It's not just me that's upset, it's the whole community. Anything to do with a Muslim, they make it look like he did it on purpose. "I can't see it as anything but an accident. "I can't see him hurting a fly, let alone a human being." Chairman of the Central Mosque in Birmingham, Nassar Mahmood, said he was "surprised and shocked and saddened" after hearing about what happened in Westminster. He told the media he "understands that the gentleman had papers with him to renew his visa and had no intention to do any harm". But, he added, Mr Khater was not believed to have worshipped at the mosque, which is close to the Highgate flat. Mr Mahmood added: "We're dealing with unprecedented levels of Islamaphobia at the moment so please don't apportion any blame ahead of a police investigation. "As far as we know he was a very good person and a keen footballer playing regularly in the community." Sudanese community member Ali Mohamed told a news conference at the mosque he understood Mr Khater had had an appointment at the African country's embassy to apply to travel back to Sudan. But a source at the Sudanese Embassy in London told the BBC that staff had "no recollection" of Mr Khater and that "no-one knows anything about him." The source said they could find no information about Salih Khater having an appointment there, but confirmed people can turn up without an appointment for visa issues. Police have also raided a flat in Peveril Street in Radford, Nottingham. Faisal Edreis, who lives at the flat, said: "When the police came I was inside the house. "They asked for details for the previous people but I don't know. It's a shared house and people come and leave; many people come and leave." Birmingham Hall Green MP Roger Godsiff said: "In Birmingham we have a very large multi-cultural community. "In the Sparkbrook area, in my constituency, there is a complete mix of populations and by and large they live quite peacefully side by side." The Labour MP added that the "vast majority" of people in Sparkbrook were law abiding and "just want to be left to get on with their lives".